Human rights activist Brebner Changala has said President Michael Sata must not turn State House into a sick bay or an emergency room for his health. Changala said in an interview in Lusaka that it had become apparent that there was something wrong with the President because of this perpetual absence from critical public matters that are pressing the people of Zambia. 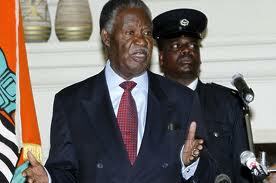 President Sata had been missing public appearances for a long time. Last week, Sata was absent at the International Women’s Day celebrations in Lusaka and he also anubbed the Youth day commemoration earlier this week opting to delegate vice president Guys Scott to officiate at the events. “It is clear that Mr Sata is not in good health to run the affairs of Zambia. He cannot stand to attend to the so many pressing issues. It will not help to keep his poor health status as a secret. It is the first time we are seeing State House being turned into an emergency room or sick bay to attend to his health,” he said. Changala said there was a curtail of five people who he would name in due course, which was holding the President hostage and this team of crooks was taking advantage of the weakened head of state. He said this curtail was governing the country outside of cabinet, without the full involvement of elected and sworn in members of the ruling class. “In recent times, we have seen serious matters that are supposed to go to Parliament are exposed to the people through the Post Newspaper first and not through the established system of the government. This is a serious precedence, which is being set through the bad health of the President,” he said. Changala said the opposition movement in Zambia had been made to look irresponsible and not necessary. Opposition Members of Parliament are being poached at will, while opposition leaders are arrested and locked up arbitrarily. “The civil society has collapsed as well. The Kaunda era of fear and terror is back and sooner, there will be a declaration of one party participatory democracy and that will be the end of Zambia,” he said. The Catholic church, Changala said, had been an accessory to the trouble that Zambia had entangled itself into by electing the Patrotic Front (PF) into government. He said the Catholic church campaigned vigorously for the PF and they had continued to eat with the ruling party hitherto. “My church, the Catholic church, is an accessory to this tragedy. The Zambian mainstream media also campaigned for the PF. They campaigned for the PF and made sure they won elections. But now, they are failing to control the monster. But these fraternities have not abandoned the weak in society and are having a good time with the PFthey no longer pursue economic and social development that they promised,” he said. On the Public Order Act (POA), Changala said the piece of legislation had been abused with impunity by the PF government such that the policeman in society had become supreme and could lock up any citizen without any reason. He said people’s freedoms and liberties were now at the mercy of the Inspector General of Police and not the law and the constitution. On the impending removal of immunity from prosecution of former president Rupiah Banda, Changala said this campaign was nothing but a deep desire by a clique of people who want to humiliate and embarrass the former president. Changala said the people behind the calls to lift Rupiah Banda’s immunity from prosecution were not doing that as a matter of policy from the cabinet, but it was coming from a clique of crooks who were controlling the president. He said the calls to lift Rupiah Banda’s immunity from prosecution was a venture not in public or national interest, but it was meant to satisfy personal egos of vengeful andheartless individuals. “They do not have a serious case other than that of political nature. They see Rupiah Banda as a man who brought them down through the Development Bank of Zambia loan. The calls for the removal of Rupiah Banda’s immunity, unlike that of the late Frederick Chiluba lcks the massive support of Zambians,” he said. Changala said the casualties of hate speech and all the wrong campaigns had been United Party for National Development leader Hakainde Hichilema, his MMD counterpart Nevers Mumba and embattled Kabwata Member of Parliament Given Lubinda. “Any strong opposition opponent is being grounded and I appeal to the people of Zambia to see how countries such as Rwanda and Zimbabwe found themselves in those situations and that if left unchecked, elected criminals and vagabonds who usurp people’s confidence will leave Zambia at the crossroads,” he said. On the PF victory in the Livingstone parliamentary by-elections, Changala congratulated the ruling party saying they should continued with the streak of successes since they had created an environment of fear and terror. He said the PF was not the best political party in Zambia at the moment because they were disorganized lot whose foundation was based on lies and deceit. He said the PF government lacked a vision for the development of Zambia because they party behind the administration was hinged one man. “If Mr Sata leaves, the PF will not be there because of the lack of a clear and formidable leadership. I wish to encourage the opposition in Zambia to soldier on. There is no clear and fair platform for participation. The opposition have no access to the media fairly,” he said.